Central peaceful holiday home with free wifi. Charming refurbished 3 bedroom Lockwood holiday house looking over stunning Lake Taupo, with views of the mountains, town and the surrounds. This well-appointed holiday home is an excellent two family option and is private and quiet, has central heating for hot or cold air, Sky TV, UFB fibre broadband internet, two toilets and a shower. A large open air fully fenced hot mineral pool ideal for relaxing after a busy day is available for hire. The open plan kitchen, dining and lounge creates a family friendly environment. Sheltered deck with BBQ and front deck seating for relaxing and watching the sun go down over lake and the hills beyond. The property is located up a private drive way, providing privacy and excellent lawn area for holiday activities, yet close to town and the lake front. Large double garaging for all the toys and off street parking. 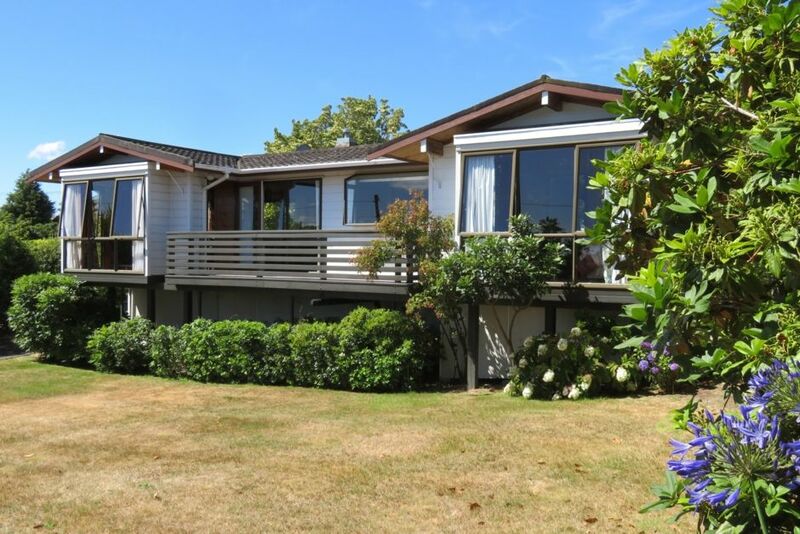 5 min walk to the lake front and 5 min drive to central Taupo shops, cafes and restaurants. Great for families and groups. Out of respect for neighbours and our property, not suitable for partying. We provide an instruction booklet guide for using the central heating plus ideas for things to do while staying in Taupo. Mineral pool service fee $60.00. The pool will be cleaned and ready to use on arrival. Special conditions: We ask all guests and visitors to respect our neighbours enjoyment of the peace and quiet location. Have fun, enjoy yourselves but no noisy, loud, late night parties please. We love our holiday home and I'm sure you will too. Please look after the home as though it was your own and if something happens please report it to the Property Manager ASAP so it can be repaired or replaced. For large damaged items be aware that we do retain credit card details to cover against damage to the property. We want you to really enjoy your stay, spread the word about how good it is and return again yourselves. Smoking outside only. Geothermal Hot Pool, note pool is left empty. You will need to fill on arrival if you wish to use it. Great location, enjoyed our stay, a shame the mineral pool not working though. The advertisement said sleeps 10 with 8 beds when In reality there were only 7 bed. The advertisement said sleeps 10 with 8 beds when In reality there were only 7 bed. Not a huge issue but with ten adult males it was a squeeze.